The mountains of Northeast Tennessee are wildly alive. Every single day, some new face of nature shows itself. In the beginning I wanted to know about everything, immediately. Which tree was the hemlock that was used to build our house? Which were the tulip poplar and the sourwood the bees love? Where could I find the plantain? We might need a a poultice! It’s been a process, but tree by tree and plant by plant, we’ve been getting acquainted. For the most part, I’ve learned to be patient and take the lessons as they come. But every now and then, something happens, like the goldenrod this year. It’s been insane. Fabulous, blinding yellow! Everywhere!! I knew the time to try my hand at natural dyeing had come. I decided it would be fun to throw several different types of fiber into my dye pot. I wanted to use some of the Border Leicester top that was a Christmas gift last year from my dear friend, Pam. 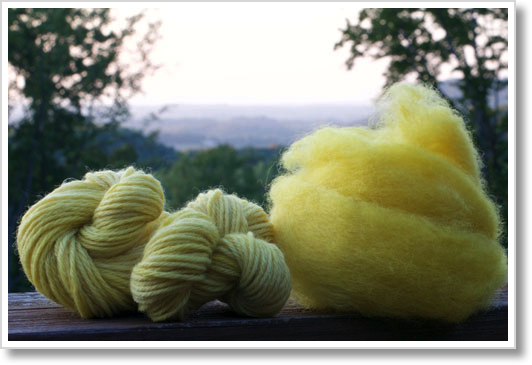 I also wanted to try dyeing some thread, so I ordered some Dye-lishus cotton from New World Textiles. I had some Lion Brand Fishermen’s Wool and some Plymouth Galway Worsted yarn on hand, so I grabbed those, and I even tossed in a piece of cotton dish towel, just to see what would happen. The first step was to scour everything and then to mordant all but the Dye-lishus thread. I used alum as a mordant and just followed the directions in Chris McLaughlin’s A Garden to Dye For. The best part was making the dye bath. You’re really not supposed to do this in your kitchen . . .
I’ll figure out a better plan down the road. Something about working with plants growing just a few steps beyond my door made the whole experience feel kind of magical. Here’s how things looked straight out of the pot. Here’s everything today after having time to dry. I’m in love with the Border Leicester top. It took the color beautifully. The yarn is a little lighter than I’d like, and there are some spots where the dye didn’t take as well as it did elsewhere, so I’ll need to work on that. I’ll also need to figure out how to get better results with the cotton thread. It ended up a dull, tan-ish color–okay for some things, but not what I was hoping for. Bottom line: this was big time fun and an excellent jumping off point for a new project I’m anxious to begin! I’m going to be doing a stitch along with Bradie, whose Healing Handcrafting blog has become one of my absolute favorites. Bradie has written beautifully about the process here and here, and I will be posting about my own progress soon. In the meantime let me recommend the book we’re using for inspiration. It’s Slow Stitch: Mindful and Contemplative Textile Art by Claire Wellesley-Smith. Both the writing and the photographs are something to be savored. That’s my little hank of hand-dyed thread on top. Look at this great photo from 1914! In honor of the first day of Autumn, I made blackberry buttermilk cake for lunch. It was this recipe, but with blackberries. It was very good. I was out of town for awhile. There was knitting and beer drinking in a hotel. 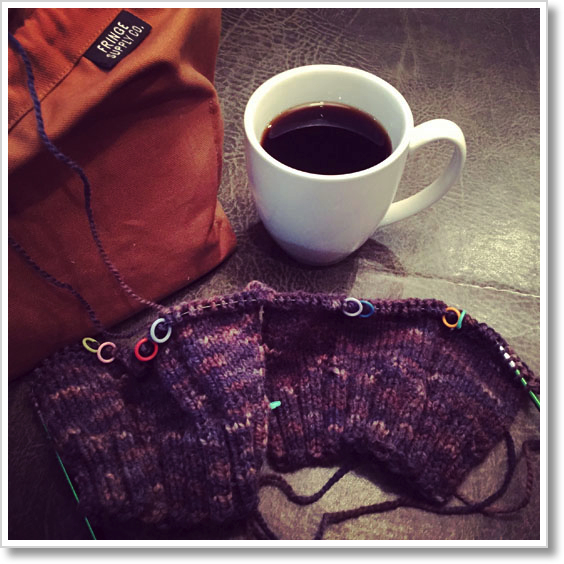 There was knitting and coffee drinking in a couple of different airports. 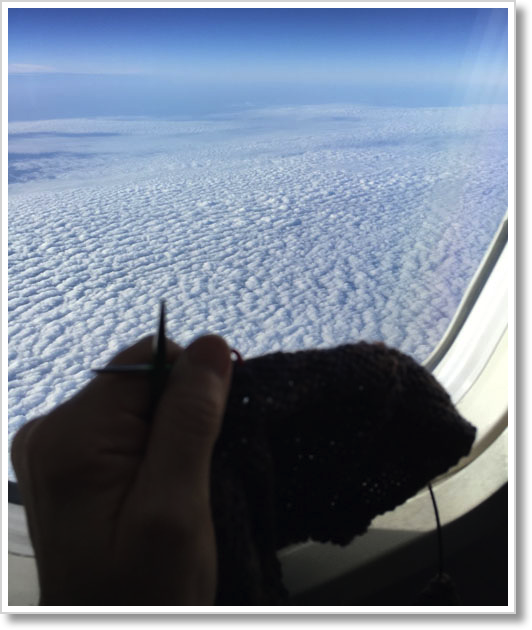 There was knitting on airplanes. I’ve also learned a few things. Did you know that the poet Marvin Bell has a son who’s a song writer? His name is Nathan. One interesting (if not particularly well written) article claims he “may be the Woody Guthrie we need in the age of globalization.” More research is definitely in order. I also came across the work of Lisa Anne Auerbach. Who knew? The well is a little dry at the moment, so I’m trying to fill it up. Hopefully, I’ll have more to say soon. In the meantime, thank goodness for knitting. Be well, my friends. Knit on.